by Chris Woodford. Last updated: March 30, 2018. It's a hot summer's day and you've decided to go on a 16-km (10-mile) walk along the coast. You've almost home... when you feel a sudden stabbing pain in your foot. Taking off your shoes and socks, you find the skin has worn through and a blister's forming. What can you do? Struggle on and you'll make it worse with every step. But you're miles from anywhere and there's no other way home. This age-old walker's dilemma has become a lot less of a problem thanks to the development of amazing blister plasters made of hydrocolloids. Not only do they protect the wound and keep it clean, they cushion it and allow it to heal faster by absorbing and wicking away its moisture. Photo: A hydrocolloidal plaster looks much like a normal one when you take it out of the packet, but it feels thicker and much less flexible. It's only when you apply it to your skin that you find out how differently it works. There are many different brands available, including these Compeed® ones made by Johnson & Johnson. Others include Comfeel®, Tegasorb®, and Hydrocoll. They're easy to find in drug stores (chemist's shops), but you'll also find them in sports and outdoor stores among the walking and hiking supplies. In hospitals, hydrocolloidal wound dressings have been used for treating many types of wounds (including burns, ulcers, and sores) for over 20 years. Photo: A blister on the foot: a moist wound that heals in a few days if you keep it clean and dry—but a real nuisance if you're on a walking holiday. Hydrocolloidal dressings help blisters to heal quickly and hygienically, even if you're out and about. Sorry about the gory photo! It's here in the interest of medical science. I made it as small as I could! Take the protective layers off a hydrocolloidal blister dressing and you'll see that it looks quite different to a normal plaster. It has a sort of rubbery texture, a bit like a chewy sweet that's been run over by a steamroller. The material you're looking at contains a substance called a hydrocolloid that likes to absorb moisture. A colloid is an evenly spread-out mixture. You've probably heard of emulsions and aerosols, which are two common types of colloid. Milk is an emulsion (a mixture of fat particles in a watery fluid) while smoke (a mixture of soot particles in hot rising air) is an aerosol. "Colloid" is the broad, overall name for substances like aerosols and emulsions where one substance is distributed through another. A hydrocolloid is simply a type of colloid where a substance is mixed with water. Hydrocolloidal substances (such as gelatin) love to absorb water to form a gel. In a hydrocolloidal plaster, the rubbery stuff contains a gel-forming material such as sodium carboxymethylcellulose (a water-soluble polymer made from cellulose) mixed with gelatin. There's a top layer of elastomer (elastic material) to hold the plaster together, while your body flexes beneath it, and there's some harmless adhesive mixed in so the whole thing sticks to your skin and stays there for at least a few days. 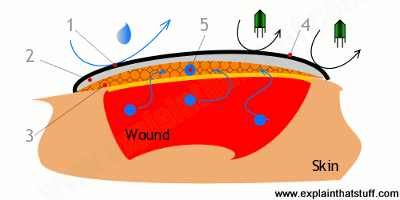 How does a hydrocolloidal wound dressing work? Stick a hydrocolloidal dressing onto your blister and it starts to absorb moisture from the wound (medically, this is referred to as "exudate") to form a gel. That's why a hydrocolloidal blister dressing rapidly turns into a soft and spongy mass that cushions your wound, allowing you to keep on walking. The gel is cohesive, which means whatever leaks from your wound stays in place under the dressing. Initially, the dressing doesn't let water vapor escape. But, over time, it becomes more permeable and the wound gradually dries out and heals beneath it. Unlike with a normal dressing, it's usually possible to remove a hydrocolloidal dressing without damaging the wound beneath. Great news for blister sufferers, because the last thing you want to do is tear newly formed skin. The waterproof outer layer (black), made from something like polyurethane film, keeps moisture out of the wound. A middle layer of foam sheet (gray) provides cushioning and keeps the wound warm. The hydrocolloidal layer (orange honeycomb) absorbs exudate from the wound and turns into a soft, spongy gel. It also seals effectively around the edges of the wound to stop any exudate from leaking. Dirt and bacteria can't get past the outer layer. The gel keeps nerve endings moist, helps to reduce pain, and encourages skin repair. I'm not a physician (doctor) and I am not offering you definitive medical advice, but here are a few quick tips from my own experience of using hydrocolloidal dressings that you can take or leave as you wish. Be sure to read the instructions that come with your wound dressing before you start. Consult your physician if you have any doubts about what you're doing or whether a hydrocolloidal dressing is the correct thing to use for a particular wound. If your wound doesn't clear up quickly, or you suspect it may have become infected, be sure to seek expert medical advice. Photo: Hydrocolloidal wound dressings, like this Comfeel plaster, are often made from transparent or translucent materials so you can check how a wound is healing beneath them. I've found that hydrocolloidal dressings work better on some parts of your foot than others. Unless you're going to keep your foot still, they're less effective on toes and heels than on the wider areas, because they tend to work their way free before the wound is properly healed underneath them. You can stop this happening by applying some tape to the underside of your blister dressing to keep it in place—at least to begin with. It's important to choose a blister dressing that's big enough to cover the wound completely and make a perfect seal all around it. If you use one that's too small, you'll find the hydrocolloidal gel starts to leak out under the edges. The wound won't heal, dirt can get in underneath it, and you can easily damage the wound again when you remove the dressing. If you're off walking or hiking, the best thing is to buy (and carry) a little box of dressings of various different sizes: bigger ones for heels, smaller ones for toes. Don't try to peel a hydrocolloidal dressing away from the wound until it feels ready to come away all by itself. Remember that the wound and the dressing merge together as the new skin forms. Take the dressing off too soon and you'll take the new skin with it—ouch!— and you'll have to start all over again. So be patient! If you're at home and you don't need to move around much for a couple of days, you might well find that a blister heals best simply by leaving your foot open to the air without a dressing of any kind. If you're on a long walk, you can't really leave a blister as it is—unless you want to hobble home in pain. That's exactly when a hydrocolloidal dressing really comes into its own. Apply it properly and it should get you to the end of your walk in complete comfort! This is what the plaster looks like when it's first applied. Make sure it's centered on the wound and big enough to cover it completely without the wound being anywhere near an edge. Firm down the plaster all around the edges to make a good, clean seal all around. Within hours, you'll see a little white blob forming in the middle where the plaster is removing moisture from your wound and helping it to heal. Once your plaster is in place, leave it alone for a few days. You may have to wait a week or even longer until you can safely remove it. Just watch, wait, and be patient. Take the plaster off very slowly and carefully when you think it's ready. Eventually, your skin will be as good as new. What else can you use them for? One of the great things about hydrocolloidal dressings is that they're designed to be very kind to your skin. That's why similar, self-adhesive patches are also used for applications like medical or personal security monitoring; instead of a wound dressing, the pressure-sensitive adhesive sticks an electrode, electronic monitor, RFID tag, or something similar to your body instead. Just like a blister plaster, you can pull these things away without harming your skin. Clinical Guide to Skin and Wound Care by Cathy Thomas Hess. Lippincott Williams & Wilkins, 2012. Hydrocolloidal dressings are covered in the section beginning on p.364. Handbook of Hydrocolloids by Glyn O. Phillips and Peter A. Williams (eds). Woodhead Publishing, 2009. Covers all the different types of hydrocolloid, mainly in the context of food processing. Hydrocolloid & Hydrocolloid Dressings Training Video: This is an excellent, clearly explained video introduction from Woundeducators.com, covering the different types of dressings, when you should use them, and when you shouldn't use them. It's about medical-type dressings rather than blister plasters, but the same principles apply. 3M™ Tegaderm™ Hydrocolloid Dressing: This is a more technical introduction, explaining to professionals how to use hydrocolloidal dressings. There's a very clear explanation of how to apply a large wound dressing to a rather unpleasant looking rubbery buttock! Again, this is about medical dressings rather than blister plasters. US20080275327A1: Bandage for adhering to moist surfaces by James Ling Chen. ER Squibb and Sons LLC, September 5, 1967. I believe this was the first patent to describe a hydrocolloidal wound dressing (eventually marketed under the name DuoDERM®). US20080275327A1: Hydrocolloid pressure sensitive adhesives by Roger D. A. Lipman. Avery Dennison, December 4, 2001. Another detailed technical description of how hydrocolloidal adhesives work and how they're made. US20080275327A1: Three-Dimensional Adhesive Device Having a Microelectronic System Embedded Therein by Susanne Holm Faarbaek et al. March 9, 2005. This patent application describes medical monitors held to the skin with pressure-sensitive adhesive. 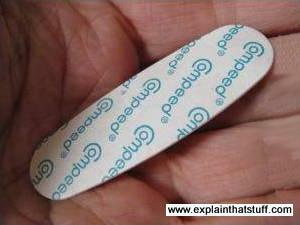 Compeed is a trademark of Johnson & Johnson Corporation. 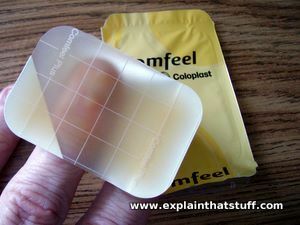 Comfeel is a trademark of Coloplast A/S LLC. DuoDERM is a trademark of ConvaTec Inc.
Tegasorb is a trademark of 3M Company.